How did you hit on the idea for this iPhone app? I saw an advertisement for iPhone on the side of a bus – it looked like a picture exchange book to me. Grace used an actual book full of little pictures for 6 years before I developed the app. What exactly does the app do? It replicates a book of pages which have all the pictures that a person with autism needs to communicate. Colors, numbers, shapes, Food and Drink, things to play with. It puts each of these pages in a folder and you can then open it, select the item you want and the small picture appears at the base of the screen. Put all the pictures together and you make a sentence. How does your daughter get along with the app? The book with pictures works very well at home or school, but it was too big to carry around when we went to the shops or swimming pool or to McDonalds. So if she wanted something that she couldn’t reach she would not have the ability to ask for them. She might stamp her feet or cry or try and grab for things and I wouldn’t know what she really wanted. She has a lot less frustration and tantrums because she can always explain what she wants, even in a new situation like in a supermarket. If we are looking for something and she cannot explain, we hold up the phone and take a photograph, or google it on the internet using the iPhone, save the picture and then show her how to ask for it. Her articulation has improved with practice. She has gone from using single words like “DWINK!” to saying “I Want Apple Drink” and she has photographed and googled her own choices too. She also calls the hairbrush, the mirror and her toothbrush a “FRR” – this is not good. With a photo of the Brush she can say “BRUH” – the picture is her reminder. Eventually she will be able to say the whole word and remember it because she can remember the picture. iPhone and waive a voice output. How did that decision come about? That way we slowly practice and improve her vocalisations. Gracie did not learn to speak until she was 6. So her mouth muscles are poorly developed. By always modeling and prompting I can help her develop her vocalisations so that anyone can understand what she says. With voice output devices there are two problems. The autistic person does not learn the social contract. They may be alone and pressing the button that says “I want a cookie” but they do not go and find the person who can get them a cookie. This is a particular problem with Autism. People with Downs Syndrome or other Mental impairment will usually be better at social skills. They know they have to say “Hello” when they meet you and will say goodbye. The Autistic Person has to be reminded to do this as they do not find social contact naturally rewarding.If you make sure they always have to find you and share the pictures with you, you can reward them with the treat they are asking for. They then find you socially rewarding and may even begin to share even more social contact with you. This is very important for the parents who may not have had this kind of interaction from their child ever. The sentence needs to be modeled, and prompted.If Gracie comes to me with a sentence “I Want Cake” I will read it with her while giving her a chance to say each word. She will get a small piece of cake. If she shows me the sentence – “I Want Cake” and says with me “I WANT.. CAKE!” I will give her a bigger slice of cake! So she knows that this was even better than just pointing at the pictures.If she comes to me without her pictures and says “I WANT CAKE!” then I would give her the whole cake. Then she knows that talking is a really good thing to do. You can only do this if you are interacting, waiting and prompting the child to say each word. An electronic voice cannot do this. We would like to release a Free App for helping all children with Autism to say when they have a pain somewhere. It is hard to teach this to autistic children, even when they can talk so I think it would be great if we could make this possible for everyone. I would like to travel a bit more demonstrating the App and helping people to teach their children to communicate and express themselves independently. I would like to partner on projects which involve translating the basic version of Grace App into other languages so that more people may benefit outside of the English Speaking World. I am especially interested in the potential to develop the App in Arabic through the great connections I made at the World Summit Awards. I am especially grateful to the UN and World Summit Awards for Mobile Content for bringing me into contact with so many other talented developers, The judges, The Faciliators and Business people who were so supportive and encouraging. I would also like you to include the Developer Steven Troughton-Smith – who did all the coding and improved the App to suit exactly how Grace Uses it. 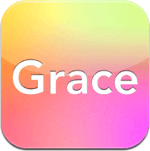 The iPhone-App “Grace” runs on iPhone, iPod touch and iPad and can be bought at Apple’s iTunes store.